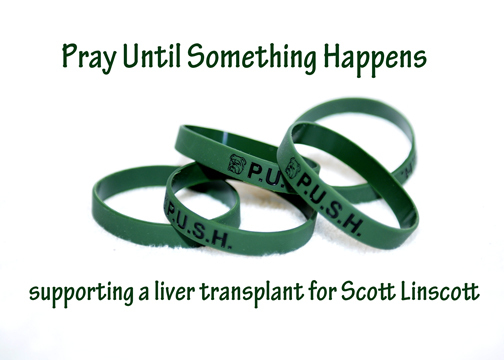 Wear a PUSH bracelet for Scott? And live the life of nausea. Ten thousand gekos, maybe more. Okay … You get the idea. Yes, after another day being sick on my couch, I’m going batty! This entry was posted in Christianity, chronic illness, facing death, Fatty liver, Fatty Liver Disease, handicapped, Liver disease, liver keys, NASH, organ donation, Organ transplant. Bookmark the permalink. Maintaining a sense of humor makes things more bearable, or at least entertaining. :o) Praying for you.